Jays is a Swedish headphone company with the goal of creating strikingly designed headphones with strong audio performance at affordable prices. If that sounds familiar, it’s because it’s a similar backstory to that of Jays’ countrymen, Nocs, makers of the NS200 ( ) I recently reviewed. However, Jays has been around longer than Nocs, and where I felt the design and performance of the $70 NS200 verged on bland, Jays’ designs have more obvious flare. Specifically, I tested the company’s $70 a-Jays Four canalbud headset and $100 t-Jays Three canalbuds. Canalbuds like the a-Jays and t-Jays essentially split the difference in design and price between traditional earbuds and in-ear-canal (“canalphone”) models. (See our in-ear-canal headphone primer for more details.) Since they fit partially in the ear canal, canalbuds block some external noise and aim to form an acoustic seal that improves bass performance. However, they don’t block as much sound as true in-ear-canal models, and, as with those models, getting a proper fit can be tricky, the cord can produce unwanted microphonic noise in a listener’s ear, and using the headset function can be weird due to the occlusion effect of having your ears plugged while talking. The most distinctive element of the a-Jays’ design is their flat black cables, about the same width and thickness as a fettucini noodle, which the company says were chosen to prevent tangles. On the cable leading to the right-hand earpiece is a three-button, Apple-style remote with buttons for Volume Up, Play/Pause/Call, and Volume Down); and a microphone module with a black-and-silver design that’s a nod to the iPhone 4’s appearance. The a-Jays’ earpieces are short, black cylinders with silver-plastic accents on the back and capped by black, silicone eartips. All the a-Jays’ black surfaces have a pleasant rubbery feel. Rounding out the package are five pairs of eartips: extra extra small, extra small, small, medium, and large. In using the a-Jays, I found the cord design performed as advertised—the cables resisted tangling, and even when I intentionally tangled them, the tangles worked themselves out with minimal effort and did not pull into tight knots. However, I also found the cables to be heavier than traditional designs, pulling on the earpieces and causing slight discomfort (although the weight never actually dislodged the earpieces). Additionally, the beefy cables produce strong microphonics, so between those two issues, I don’t recommend the a-Jays for active use. Otherwise, the short earpieces are easy to insert, with a comfortable, shallow fit and moderate isolation. I particularly liked the remote design, as the buttons are easy to distinguish by touch (the volume buttons are concave, while the center button is convex), addressing my most frequent complaint about such remotes. In testing the a-Jays’ inline microphone, I found that it was quieter and less detailed than the iPhone 4’s internal microphone. It was also not quite as natural as the excellent microphone in Radius’ Atomic Bass 2+mic ( ). However, performance was still quite good overall, and more than adequate for taking phone calls. The a-Jays’ sound will appeal to a lot of listeners—music sounds smooth, full, and relaxed. Bass is heavily emphasized, but this exaggerated low end doesn’t sound as obnoxious as on other bass heavy headphones, and it doesn’t obscure midrange and treble frequencies. The treble frequencies are relatively easy to hear but never harsh, which should benefit poor-quality recordings. Jays claims that the a-Jays’ midrange has been tweaked for headset use, and indeed, midrange detail is better than that of the low and high frequencies. However, this also exposes the biggest drawback of the Four: the smooth lows and highs means detail is obscured in these areas—cymbals don’t always pop, and bass sounds a bit loose and flabby. This also makes the headphones sound crowded and lacking silence between notes. However, there’s something to be said for prioritizing a pleasant sound over an accurate one, and if this was Jays’ goal, the company succeeded. I compared the a-Jays to Maximo’s $80 iP-595 (( )), a long-time favorite in this price range. The iP-595 provides the space and definition that the a-Jays lack, high frequencies are more pronounced and detailed (though sometimes harsh), and bass is tighter. On the other hand, the a-Jays Four almost matched the Maximos in midrange performance, with fuller vocals, although the iP-595’s vocals were clearer. Overall, the Maximos will give you a more exciting and detailed sound, with the Jays offering a smoother, more relaxed sound. I also compared the a-Jays to the aforementioned Nocs ns200, and while the NS200 offers a bit more space and detail, bass is more oppressive. In the end, the NS200 occupies an uncomfortable middle ground between the sound of the a-Jays and the iP-595. The t-Jays lack headset and remote features, but feature an angled earpiece design that enables the earpieces to nestle in the listener’s ear, providing a fit with a deeper insertion and more isolation than that of the a-Jays Four—the fit is closer to that of a traditional canalphone. The t-Jays also have a more traditional cable design. However, the cable is quite short, which makes this model ideal for use with an iPod shuffle clipped to a shirt or an player stashed in an arm band. Jays also includes an extension cord that gives a more conventional cord length, but the extra connection adds bulk to the cable. As with the a-Jays Four, the t-Jays Three includes five sizes of eartips, but the Four also includes an airplane-audio-jack adapter, a headphone splitter, and an attractive carrying case. These accessories are a nice touch, although I found the carrying case’s design made it difficult to close once the headphones were inside. When I first listened to the t-Jays, I noticed an obvious improvement over the a-Jays. The t-Jays manage to add detail and space without sacrificing the a-Jays’ smooth, pleasant sound. Bass remains strong, but is much tighter, while treble and midrage are more prominent and detailed. I again used the Maximo iP-595 for comparison: The quality of bass is similar in both models, though I prefer the iP-595’s lighter bass balance. The iP-595 also has a little more space overall, along with more detail and clarity in the midrange. But the t-Jays match the Maximo when it comes to high-frequency detail, while also eliminating some harshness. I still prefer the iP-595 overall, but both models sound great. Compared to the the t-Jays, Etymotic’s mc3 ( ), another favorite, has noticeably superior midrange and high-frequency detail, but very light bass balance. 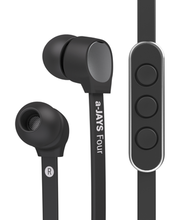 Jays’ a-Jays Four offers a nifty design, mixed ergonomics, and a relaxed, smooth sound. I prefer the sound of other headsets in this price range such as Maximo’s $80 iP-595, that offer more detail and space, but the a-Jays’ sound will be a good fit for many listeners, and the headset’s attractive styling and tangle-free cord are appealing on their own. The t-Jays Three offers an attractive design and great sound (and a short cord for those who want that feature), but its $100 price makes it quite a bit more expensive than the Maximo iP-595 (not to mention the iP-595's $60 non-headset sibling, the iM-590 [ ]), especially for a non-headset model. Still, it’s worth considering.